This spectacular oasis is part of Africa’s largest protected wilderness area and home to the highest density of elephants and big cats in the world. It is an isolated paradise with a maze of clear waterways, palm fringed islands and desert sands. Expect huge skies, close-up big game, birds, reptiles and unique water-based activities. 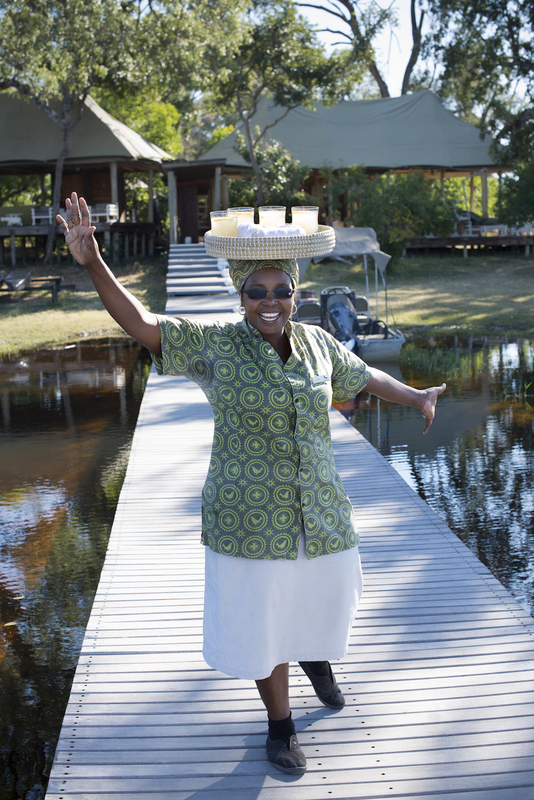 Stay in luxurious fly-in camps with fabulous local guides. We’ll find the best options for you in this UNESCO World Heritage Site. Ideal safari months are from May to September. Seasonal flooding produces the inland delta where the water flows into the desert instead of the sea. Water levels vary depending on the timing and amount of rain each year. Combines well with Victoria Falls. Spend at least four nights. Scheduled flights route in and out of Maun airport. Charter flights are arranged into the private safari lodges. We often include flights to or from Kasane for itineraries including Chobe and Victoria Falls. Contact us for options. We have handpicked the best lodges in the Okavango Delta. These privately owned and operated lodges are either on concessions surrounding the delta or within the public Moremi Game Reserve. Moremi covers much of the eastern side of the delta plus Chief’s Island. 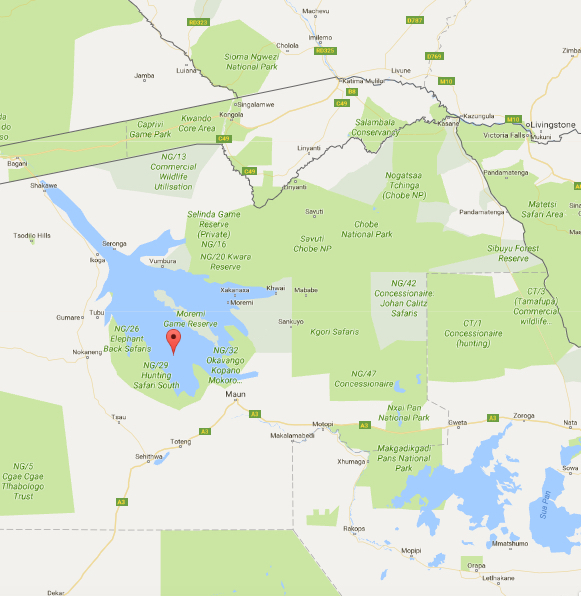 The reserve borders the Chobe National Park. The Okavango river rises in Angola and flows southeast into Botswana’s Kalahari where it disappears into the desert sands. Seasonal flooding produces the inland delta each year and water levels vary depending on the timing and amount of rain. The water levels also affect the type and variety of game and safari activities. 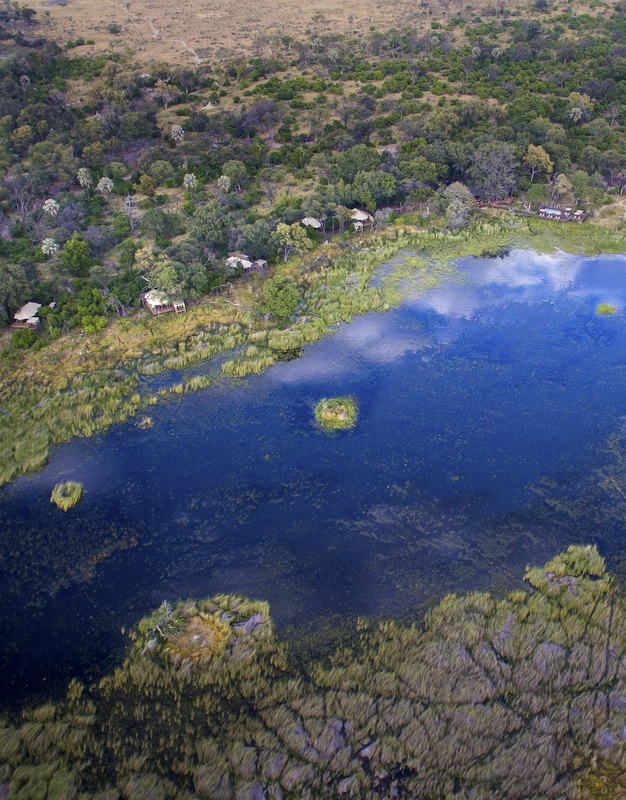 This seasonal water impacts most Okavango safari camps although some are located near permanent water. Some lodges only offer water-based activities and others are able to offer both land and water safari activities. There are also a few who only offer land-based safari activities. We discuss this in detail before recommending lodges. The highlight of any Okavango safari is being poled along the channels in a mokoro (dugout canoe) and seeing wildlife from the water at eye-level. Other water activities include trips in motorized boats and good bream and tiger fishing. Safari drives on open vehicles, night drives and guided bush walks are also spectacular. Specialist activities such as horse safaris, helicopter trips and private vehicles can be arranged. In addition to offering excellent sightings of Big 5, endangered and interesting animals, such as the sitatunga, red lechwe, the Okavango Delta is home to over 1000 species of plants and more than 400 bird species. If you love elephant then this is a great safari location for you. Talk to us about regional migrations and where your best chance is of seeing various wildlife species. 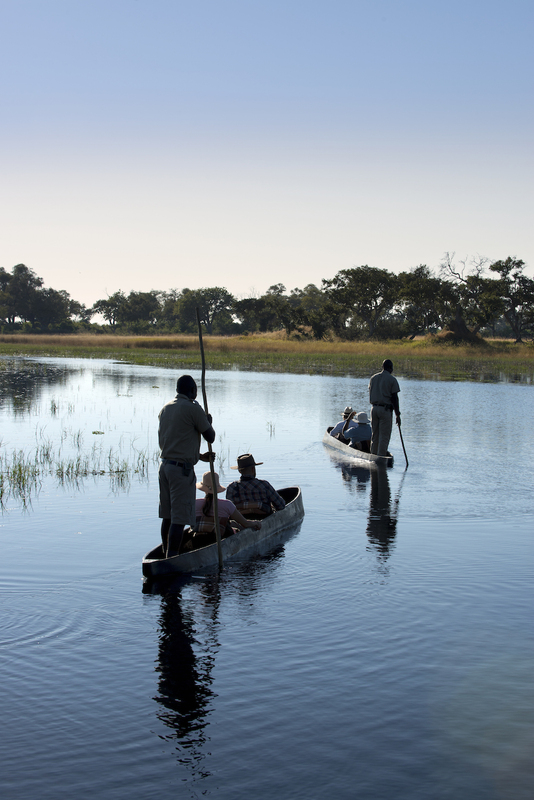 A trip to the Okavango Delta is a wild, remote, intense but magical safari experience. It also comes with a hefty price tag. We think that it is best suited to families with children who are 12 or older. 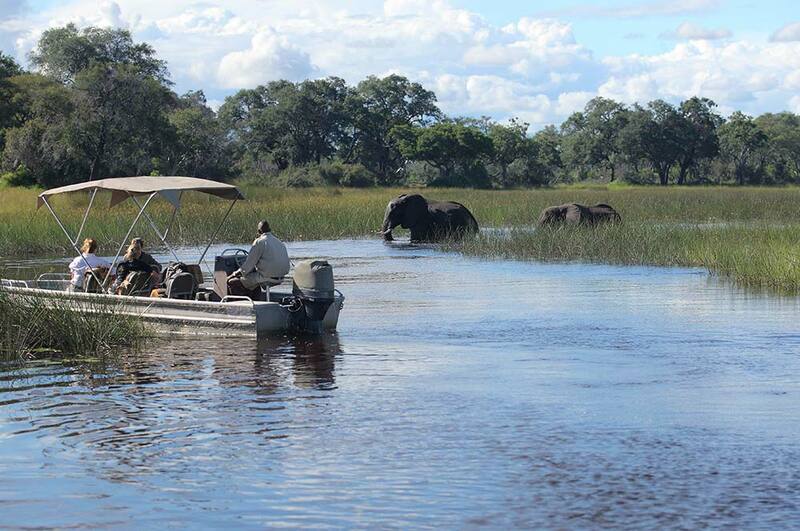 Contact us to tailor-make your family holiday including the Okavango Delta. David Livingstone visited the Moremi area in 1848 and it soon started to become exploited. The reserve was proclaimed in 1962 and, along with the private Okavango reserves, now covers about 15,000 square kilometers of protected wilderness. The Okavango Delta forms part of Africa’s largest conservation area called the KAZA or Kavango-Zambezi Transfrontier Conservation Area. This incorporates parks in five countries including Chobe National Park, Victoria Falls, the Caprivi parks and Kafue. The Okavango Delta people consist of five main groups, each with their own identity and language. These include various indigenous San people whose ancestors were the first inhabitants of Botswana. Rhino were re-introduced in late 2001 and are now successfully breeding and seem to be protected from the scourge of poaching killing so many in South Africa. 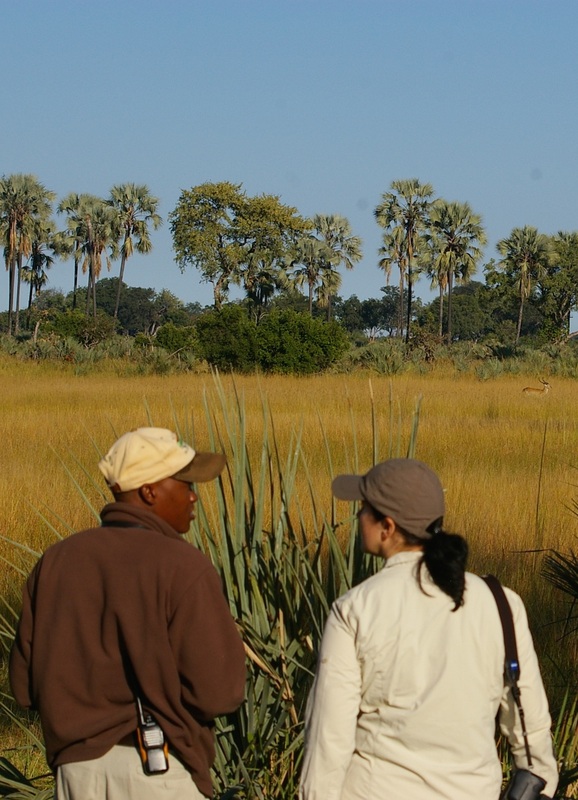 We’ll answer all your questions on what to wear and what to bring to the Okavango. For those already planning a safari we suggest that you bring long trousers, closed shoes and natural coloured clothing. Pack a sunhat, sunglasses and sunscreen to protect you from the African sun. Bring a warm hat, jacket and scarf for the cool morning and evening activities. Don’t forget your camera, video camera and binoculars (if you have). Bring mosquito spray and take advice on anti-malaria medication. The Okavango Delta is a malaria area. Floating in a mokoro to discover wildlife on the islands, floodplains and swamps. Fly-in camps with awesome aerial views and wildlife spotting from the plane. Pristine wilderness in a country with less than 3 people per square kilometer. Luxurious camps, private suites and romantic sunsets. Off-road game drives and incredible wildlife, birds, insects and reptiles. Throwing in a line to catch tiger and bass. Camping under the stars on mobile safaris or just star gazing in camp. Interacting with San and other indigenous people. Guided bush walks with an experienced and armed local guide. Experiencing thriving wildlife, especially elephant and big cats.